Question: Are these molecules enantiomers, diastereomers, or the same? If you immediately recognized this as a molecule with an internal plane of symmetry (and thus an achiral molecule, incapable of having an enantiomer), congratulations. If not, you just fell into The Meso Trap. 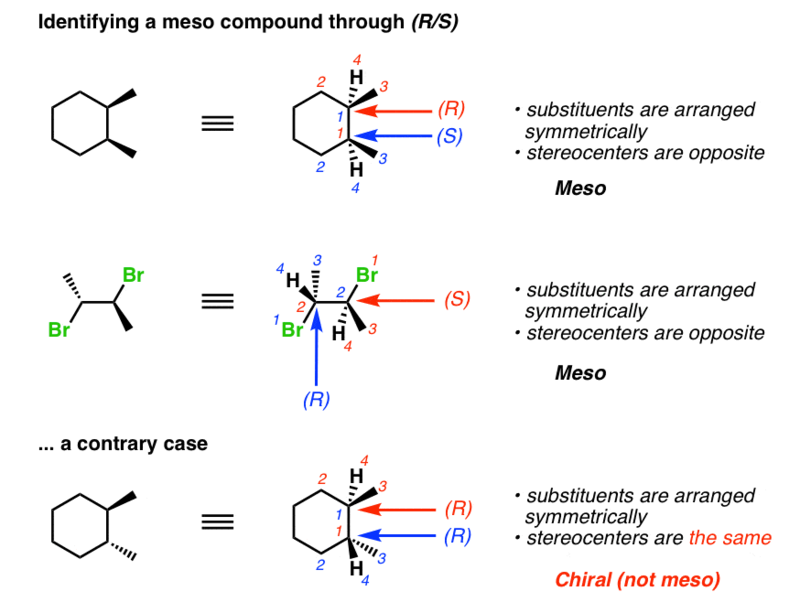 The Meso Trap is a common feature on exams and tests to make sure that you understand the concept of chirality and that you are paying attention. Just to make things clear, a meso compound is a molecule that has chiral centers but also has an internal plane of symmetry. This renders the molecule achiral: it does not have an enantiomer, and it does not rotate plane polarized light . It is similar to a phenomenon found in certain two-headed, two-tailed cats. These are all fundamental skills. We are not talking about trivial stuff here. It can come up in glaringly obvious ways (like in the above example) or in a number of other ways, as in these examples, where the meso compound is not nearly as obvious, and drawn in different projections. The Meso Trap can also sneak up on you in other ways, like when you’re being asked for the products of a reaction. In the following example, you might be tempted to draw in not only the product of the reaction but also its enantiomer. In this case, however, the product is a meso compound… meaning that there is only one product. Identifying a meso compound means being able to identify a plane of symmetry in a molecule. It’s important to realize that this can cut either through a bond or through an atom, as in the following examples. What if the plane of symmetry isn’t obvious? That’s when you really have to demonstrate that you have a few important skills – like the ability to recognize molecules drawn in different projections, how to do bond rotations, and how to recognize (R)/(S) designations. There are really two basic strategies for identifying a meso compound if it isn’t drawn in an obvious configuration. The path of greatest resistance, but greatest reward is to learn to master how to perform bond rotations on line-wedge diagrams, Newman projections, Fischer projections, as well as to be able to convert between the three types of drawings as necessary. In the beginning stages, using a model kit to check your work is invaluable. With these skills you can take any structure given to you and be able to rotate the bonds in a way to test whether the two molecules are mirror images. A slightly easier method to determine whether a given compound is meso is to take advantage of a simple principle: meso compounds have an internal mirror plane. That is to say that not only must 1) every carbon on each side of a mirror plane have the same substituents, but in addition 2) every (R) stereocenter on one side of the mirror plane must be balanced by an (S) stereocenter on the opposite side. So if you can quickly determine (R)/(S), you can also quickly determine whether a given compound is meso without having to do bond rotations. If the stereocenters aren’t opposite, it can’t be meso. Depending on the complexity of the molecule, this can be a much faster way to do things. The key ingredient in avoiding falling into the Meso Trap is paranoia. 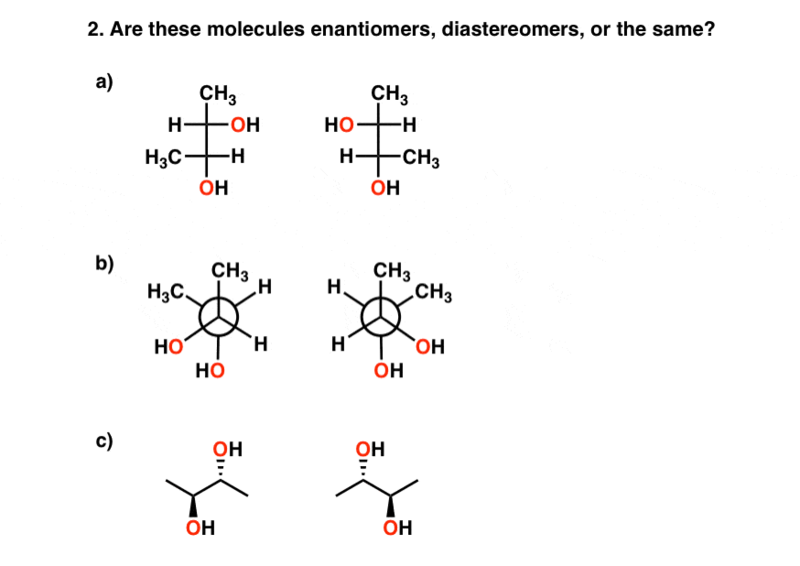 When asked if molecules are diastereomers/enantiomers/the same, ask yourself – “is this a symmetric molecule?”. Every time. After doing an addition reaction to a double bond, ask yourself: “is this a symmetric molecule?”. This comes up a lot more often than you’d expect – especially on tests. Answers: 1) the same (meso) 2) a), b), c) are all examples of the same (meso) compounds, drawn differently. 3) a gives cis-dimethylcyclohexane (a meso compound), b) gives (R,S)-2-3-dibromobutane, also a meso compound. hey! thanks for your words of encouragement last month. my blog is kind of just my little secret space where i pout and complain and pour all my frustrations into; stuff i don’t reveal to people in real life cause it would probably make people think i’m self-centered (especially fussing over a B+). i guess you could say i have a love-hate relationship with organic chemistry. it’s quite a tough class, but i really do thoroughly enjoy learning the material–at least in comparison with general chemistry. my two apartmentmates (both extremely brilliant curve setters) and i are taking the honors sequence starting this quarter. hopefully i won’t make the same mistake again by doing well in the beginning and underestimating the final exam. Posted answers, thanks for mentioning this. 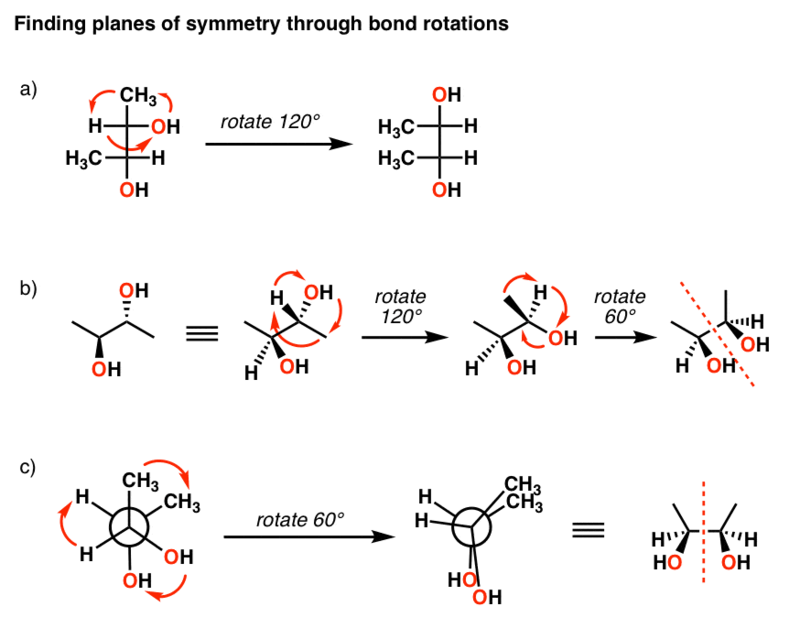 Regarding bond rotations: If you interchange any three groups on a carbon, you’ve done a bond rotation. Rotating a group 60 degrees is a little trickier, I don’t have a good shortcut for learning how to do this. OMG!!!! I just love it when some one knows their stuff AND can teach it. It is sooooo rare. Thank you! This made sense. I found this site by accident but what a fortuitous mistake. Thank you for this level of detail. I have an upcoming exam and likely would have fallen for this. Do you happen to have any more sections on your webpage regarding tricks that professors like to throw into their exams? Your site is unique in that it might as well have been made by a professor (your credentials are more impressive than most professors). Your insight is appreciated tremendously. Thank’s a million for all of this great information. I found your site while looking for tips on orgo and I have to say this is a goldmine! I am sure you get this all the time but thank you so much for all of your help. I had just being looking at this one stereochemistry problem for the past 10 minutes and this saved me so much more time. thank you so much you saved my life !! thanks but i still dont know how to determine theR and S for newman projection ? very helpful!! quick question though, just to clarify. If a molecule is chiral, is it automatically not meso? It seems like that is true from the first few sentences, but I just want to verify. You ARE a Professor and clearly an excellent one no matter what condition academe is in. Kudos for continuing to teach and doing so accessibly vs. blooming in the desert of some community college–great for the few that go there but not for the rest of us! Indeed a great work……. Thanks a lot for the material and that too presented in an easy way …. You are a genius. I have a query… How can a Newman projection be easily converted to Flying Wedge formula. This is what I thought! Great, that finally cleared my doubts. You explained it a gazillion times better than our chem teacher. Thanks a lot. 2)A the fisher projection does not seem to be meso to me. from what I see, the two are mirror images, plus have opposing chiral centers (R,S) (S,R). I also can’t seem to superimpose them. And, they both have been singly substituted at each stereo-center. I also cannot find a plane of symmetry. How is 2A a meso compound? In order to see the mirror plane you’d need to do some bond rotations. Further down the page I show how to do a rotation on the left-hand molecule so that you can clearly see the mirror plane. You can do the same thing (except opposite direction) to the molecule on the right, and you’ll also see that it has a mirror plane. Thanks for the info! I am a bit confused though because i thought number 2b was an enantiomer due to the r,s configuration being opposite in both. can you explain? in 2b, if you rotate each Newman so that the OH groups line up you’ll see that the front carbon completely superimposes on the back – the molecules have mirror planes. They are actually the same molecule, just rotated 180 degrees. Thanx for being generous to share all these! I’m confused about one of your examples above. You say that cis-1,2- dimethyl cyclohexane is meso. However, drawn as a chair, there is no plane of symmetry because one of the substituents is axial, the other equitorial. I believe that there exist two separate enantiomers of 1,2 dimethyl cyclohexane, but at room temperature they are in conformational equilibrium, so they don’t have an optical rotation. Am I understanding this correctly? Drawn as a chair, there is no plane of symmetry. However, if you draw the other chair conformation, you’ll see that it’s the mirror image. Since the molecule spends 50% of its time as either one, you shouldn’t see optical rotation. True. But it still is not a meso compound. The equilibrium mixture consists of interconverting enantiomers. That is why it is optically inactive, not because it is meso. You can fall into this trap with all 1,2-R,R-disubstituted even-numbered rings. In the last figure, cis 1,2-dimethylcyclohexane does not seem to have a plane of symmetry when it is drawn in chair conformation. Can you please elaborate on this? Thanks! Can you explain why 1,4-disubstituted cyclohexanes are not meso, even though they are achiral and “look” meso (i.e., have a plane of symmetry)? An example would be 1,4-dimethylcyclohexane. They’re not chiral because there are no chiral centers. You need 4 different “groups”. It’s a bit hard to see, but in each case the 1 and 4 positions have two identical groups – the carbon chains that connect carbons 1 and 4 are identical. Note that if it were 1,4 disubstituted cycloheptanes, it WOULD have chiral centers, because in one case you’d have a CH2CH2 group on one side and a CH2CH2CH2 group on the other. Different. Hence, a chiral center. Could a 2,4 substituted molecule like 2,4 dichloropentane be meso? And, on the same thread, if the 3C were substituted as well, would the 3-carbon not have a stereochemistry since the two equal substituents on either side make the center carbon achiral? So therefore we’d only name the 2,4 as R,S and not the 3, even if it had a chlorine atom as well? Hi Shelby – sorry for ridiculously late response, just back from summer trip. —> yes, absolutely. The (2R, 4S) and (2S, 4R) versions turn out to be the same molecule (meso, has a plane of symmetry). since the two equal substituents on either side make the center carbon achiral? So therefore we’d only name the 2,4 as R,S and not the 3, even if it had a chlorine atom as well? where the 2 position and the 4 position are not exactly the same (e.g. 2 is R, 4 is S) so it is not attached to 4 different substitutents. However, the molecule has a plane of symmetry and does not rotate plane polarized light. 99.99% of intro level courses will not cover this but the 3 position in that case would be what is known as a pseudoasymmetric center. We use lowercase (r) and (s) to indicate the orientation of the pseudoasymmetric center. In the cahn ingold prelog system, (R) is given a higher priority than (S). So for (2R, 4S) 3-methyl dichloropentane, the 3position could be (s) or (r) depending on the orientation of the methyl group. I have a follow up question regarding the lower case r/s designation for pseudo-asymmetric centers. I follow your comments with regard to the compound mentioned above: (2R, 3r/s, 4S) 3-methyl dichloropentane. What I’m finding confusing is why IUPAC prefers naming of compounds that lack any stereogenic centers at all due to symmetry with the r/s designation. For example, (1s,4s)-1,4-dichlorocyclohexane. This is name that is assigned by chemdraw and I believe it is consistent with the IUPAC rules. You probably know it involves a more elaborate application of the CIP rules with bond disconnections, etc.). It seems to me that the main purpose of nomenclature is to be unambiguous and using cis/trans for these types of symmetric molecules is perfectly unambiguous and much easier to assign than the convoluted application of CIP in these cases. I’m I missing something behind the IUPAC recommendation. Thanks for taking my question. This helped me so much. Thank you!!! Glad it was helpful Ana! I also ironically ended up here after seeking help for an organic chemistry problem only to realize I fell for this trap before I even realized what it was. Glad I stumbled upon here!